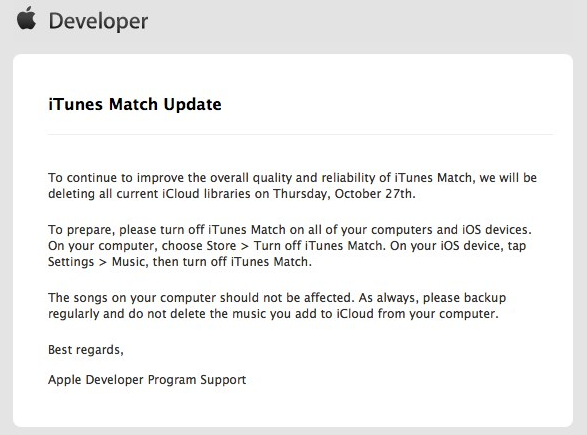 Apple has sent an email out to developers informing them that iTunes Match music libraries in iCloud will once again be wiped on Thursday, October 27th. Apple instructs developers to turn off iTunes Match on their computers and iOS devices during that time. The wipe may be in preparation for the public launch of iTunes Match. The service was originally to be launched alongside iOS 5 but was pushed to the "end of October". iTunes Match remains in beta testing with developers, and there's been evidence that Apple has been quietly preparing for its public launch. Last week, an iTunes Match toggle has appeared in the iOS 5 Music Settings pane, which directs users to subscribe to the service using iTunes. Apple has not yet publicly released an updated version of iTunes that allows users to sign up for this feature. 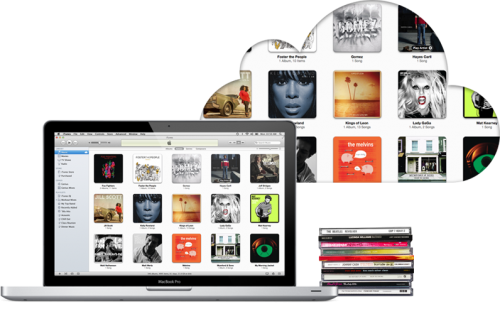 iTunes Match is a $25/year subscription service that will match your existing iTunes library with 256-Kbps versions in the iCloud. These songs will become available for download on your other Macs or iOS devices through iCloud. I hope for all Itunes Match users' sake that Apple is fixing this screwed-up system so that non-destructive upgrades are supported. It's "amateur hour" to have to wipe the database for an upgrade. This isn't even tolerable for the beta - non-destructive upgrades should have been designed in from day one. You were told this from day one. It's a DEVELOPER PREVIEW, and Apple consistently states that you should never use developer environments for production data. Besides, for buying into the Dev version Apple gave you 15 months for the price of 12. Quit your childish whining. But why, unless you're more concerned with the logo on a product than its specs and performance? Oops, never mind, Apple forum. That's churlish troll talk. Can you give it a rest? If you plan to support upgrades in the product, the Beta should support and test upgrades. Anything less is lazy programming. If your tools can't move the beta database to the production servers without "porting problems over", then your tools are bad. "Itunes Match" has "train wreck" written all over it - how many times have they wiped the database to date? Why should we not take that as a warning that the design has fundamental flaws? iCloud doesn't back up non-iTunes music unless you've purchased iTunes Match. Dude, you don't even know what they are doing. Maybe they are moving to production servers and don't want to have problems ported over that may have sprung up during testing. You always want to go to a clean slate when you are going from Beta to Production. You have no idea what you are talking about, if during development you have a bug that replicates a users playlist 1,000 times you DO NOT want to bring that data over to a production server. It would be almost impossible to port the data over reversing the effects of the bug. Just ignore him, obviously he is not a developer or knows anything about programming. Actually, detecting duplicate playlists would be rather simple. Have you ever written code using an "IF" statement? Ha, you make me laugh! The "if" statement? Really? It is not that simple, not only would you have to create playlist objects but check the data in that playlist object to make sure it is the same, and within that data (songs) there is more that you have to compare to make sure it is the same object. And when you are comparing lets say 30 songs per playlist, with 20 playlists, and 1,000 duplicates you are creating > 600,000 "if" statements for a single user. (You obviously wouldn't use an if statement) And that is just going by lets say a track name. If you have to compare 2 tracks in order to see if it is the same song you would have to compare at least 5 more things. (Title, artist, time, composer, release date, other) and that would make > 3,000,000 comparisons. This is just some stupid example I made up. I'm not surprised Match is being wiped several times. We often have our backends reset when we migrate from Alpha->Beta->Live, and we're not even a large outfit. This is an awesome feature but what happens if iCloud is down? It's happened with MobileMe. I'd be worried about lossing all my music. Any one share my concern? When, in recent memory, has the iTunes store ever been down? Did Apple lose all the music in the iTunes store? That should answer your question, you are safe. Um, from day one on the Beta they said that they would wipe it multiple times, and at least right before the official product launches. Who knows what they have been doing behind the scenes, maybe their matching algorithm is being tweaked so less songs have to be uploaded, wiping the servers would be a good way to reset with less redundant data. And the Beta participants are getting 3 free months, apple can do as many destructive upgrades they need to during this period, they are practically paying for us to test the service for them. Now if this was the case post official launch, that would be something to worry and complain about, but this is part of the matinence they warned of from the beginning. (Hell on the match my songs screen in iTunes it says "iCloud libraries will be deleted at the end of this beta")? You seem to be reaching for a reason to complain about the service, it is complaints like this that make Apple close these betas off to developers only with NDA's, because the average fan can't help but judge their product on an unoficially released beta product. So, if you're upgrading from the beta it will take a millisecond or two longer to do it right? You really don't get it do you? That was just one example that I came up with. When you are making 3,000,000 comparisons for ONE user it is not just a few milliseconds. You have thousands of users. And what about making a program that will do this? Why spend time and money creating a program when there is an easier solution, just delete everything and upload it again. It would take maybe weeks just to do something like that when wiping a database can take seconds. You would make some pretty bad business decisions if you always think like that. EDIT: And don't forget to look at your post rating!